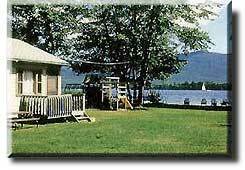 Lake Front Cottages (cabins #1-5) are air conditioned with 2 bedrooms, living room with 32" LED TV, kitchen, bath and a covered porch. Sofa in the living room offers additional sleeping space. Maintop (cabin #6) is air conditioned, offers 2 bedrooms, living room with stone fireplace, 32" LED TV, kitchen, bath and screened porch facing the lake. Crosstrees (cabin #7), this extra large 3 bedroom house overlooks the lake and has a large living room with a 42" Plasma TV and stone fireplace. Two bedrooms are air conditioned and face the lake with private screened porches. One Bedroom has bunk beds and a private half-bath. A large screened dining porch is off the kitchen. Log Cabin (cabin #8) is air conditioned, consists of 1 bedroom with a full size bed, living room with stone fireplace and 32" LED TV, twin beds are off the living area, kitchen, bath and screened porch. 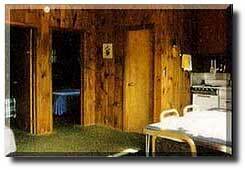 One Bedroom Cabin (cabin #9) is air conditioned with 1 bedroom, living room (with sleeper sofa) with 24" LED TV, kitchen and bath. 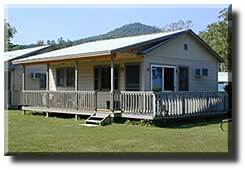 Two Bedroom Cabin (cabin #10) is air conditioned with 2 bedrooms, living room with 32" LED TV, kitchen, bath and screened in porch.